Seoyoung and Claire. Two cooks working at Eleven Madison Park met through the fortunate joint endeavors of garde manger prep. During the hours spent scraping tuna and pickling radishes, we decided it would be rather grand to teach our fellow New Yorkers about the best food we could find. The best food that wasn’t found in three or four start restaurants and food that wasn’t ranked by New York Magazine or the New York Times. Food that we found fine, but not with the fine dining price tag. We search out the plumpest dumplings, the noodle houses with the perfectly hand-pulled soup noodles, and the juiciest pork belly known to man. We will show you things that you want to know, things you may already know, and even things that you didn’t even know you wanted to know. Stick with us and we promise to show your mouth a good time! At Thanksgiving dinner this year, my brother Sam smirked as he pulled from his lap my very first diary. I quickly racked my brains trying to think what sordid details he could possibly pull from the faded pencil scratchings. Wait. I was only five when I wrote that! No worries. He opened the Little Mermaid journal and read in a giggle “dear diary, today was grocery shopping day. i ate a delicious raspberry donut. and some of julia’s cheese danish too!” Everyone laughed as he continued to read entry after entry. Entries which only listed what I ate that day and which foods I enjoyed most. Turns out I began my food writing at a young age and didn’t even remember it! After a year of traveling through much of Asia, it finally dawned on me that food was what drove me to explore these cultures. Everything was new: ingredients, cooking technique, and even how to eat. It took me a while before I felt comfortable eating with my hands. Now I adore getting dirty at the table! I came home and moved to New York–the land of never-ending food options. And here I am, after 2 years, still loving every single eating experience, good and bad, that I have. And I want to share a few of them with you! Seoyoung’s savories: My mom still looks at me in awe and says, “Seoyoung, is there any food you haven’t tried? “ After all my years of extensive eating, I still find everything new and interesting. Yes. I’m a foodie. I do not only love eating but love cooking and feeding people. Once I got back to Korea, and got an office job, I couldn’t stop thinking about cooking and feeding people. I twisted my body 12 million times in my rock hard chair, trying to figure out my direction in life. Finally after 5 years of relentless self-questioning I decided to go to culinary school to start a brand new life. Now I am in New York City, living and working, where the eating story never ends, and the food exploits with my fate-entwined friend Claire continue! I do hope you’ll enjoy the voyage that you will be a part of when you join us on our quest for yummy and cheap eats. lookin’ good, claire my love! i ‘ll read the text tomorrow when at work 🙂 miss you! claire, i love this! your description of yourself is right on and makes me smile… this is the sister i know and love so much. seriously, when will be able to get together and eat!? are you coming home this month? When do you come to Montreal to give me a long overdue cooking lesson?! Wow~ I love this blog so much! 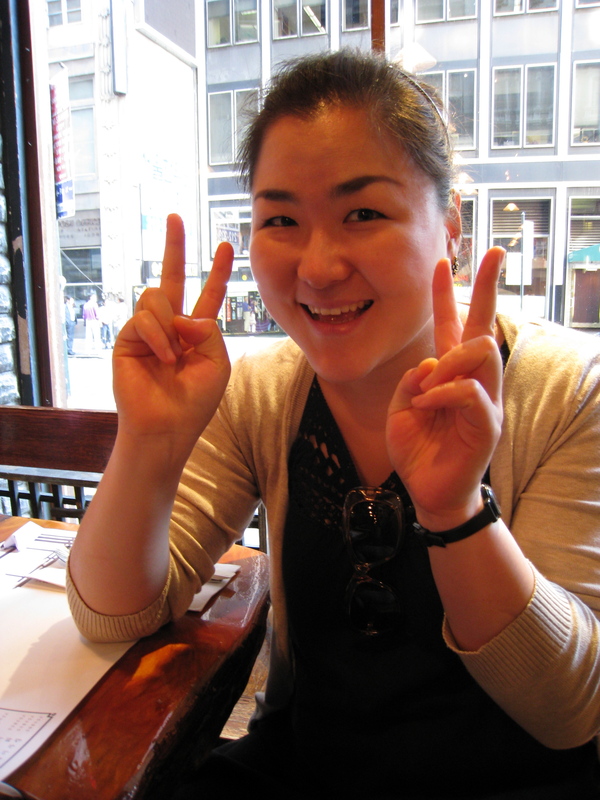 I hope many people would come to meet real korean food through your blog. Good luck ^^. I’ll be on your side as always with my prayer & heart. makes me miss nyc even more! I enjoyed your anecdote on foie gras. Thank you for your hospitality on Sat. Your korean dishes were too awesome for words. guys i love your blog! i miss nyc so much, cant wait to go back to try all these places! goose! when are you coming back? ?